Provide comfort for the family of Rina C. Gagnon with a meaningful gesture of sympathy. 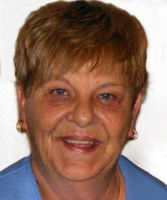 MADAWASKA - Rina C. Gagnon, 73, died on March 14, 2019, at a Bangor hospital. She was born November 27, 1945, in Clair, New Brunswick, daughter of Aime and Leana (Boucher) Marquis. After graduating from the École de Formation Infirmière in Edmundston, New Brunswick, Rina touched many lives as a registered nurse for 40 years. She worked her last years as a home health care nurse taking care of patients in the St. John Valley. She was also a long-standing member of The Optimist Club of Madawaska. Rina is survived by her two children, Paul Gagnon and his wife, Tina, and Lisa Gagnon, all of Bangor, two beloved grandchildren, Emily and Samuel, whom she loved to spoil and share jokes with; four brothers and sisters, Jeanne, Rita, Roger, Mona and their extended families. In addition to her parents and her husband Raynold, Rina was predeceased by her sister, Thérèse and her brother, Gerald. A mass of Christian burial will be held at St. Michael’s Chapel in St. Agatha, in June of 2019, with the burial in the Northern Maine Veterans Cemetery, Caribou, at a date and time to be announced. Those who wish to remember Rina in a special way can donate gifts in her memory to The Barbara Bush Foundation for Family Literacy, 516 North Adams Street, Tallahassee, FL 32301. Condolences to the family may be expressed at BrookingsSmith.com. We encourage you to share your most beloved memories of Rina C. Gagnon here, so that the family and other loved ones can always see it. You can upload cherished photographs, or share your favorite stories, and can even comment on those shared by others.